Due to the impact and uniqueness of the project for the community, it was critical that the new entry addition create a strong physical presence and identity for the Women’s Center. The existing building boasts a heavy rhythm through the use of brick & EIFS materials. The new addition is an extrusion of the dominant rhythm, yet a divergence from the existing EIFS and softened through a sophisticated and innovative white Corian cladding which offers a refined, clean and feminine quality. The exterior white Corian cladding is tied into the interior finishes creating a spa-like environment for patients and guests. The design was focused on enhancing the patient experience. 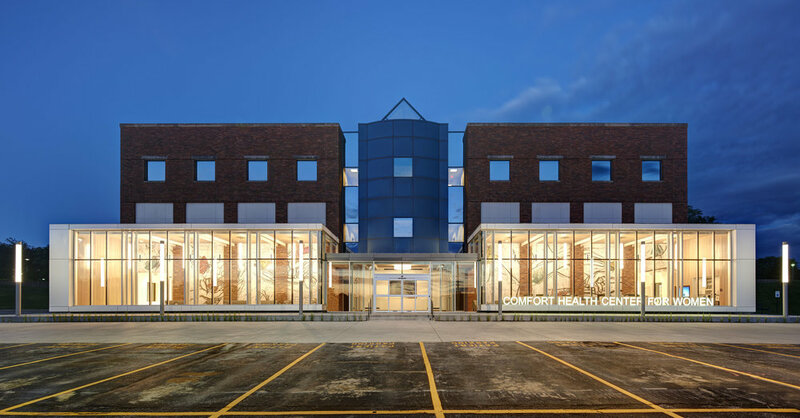 The dramatic height of the addition, quantity of glass and interior finishes promote a sense of confidence in the care patients are receiving by providing an open, bright and welcoming space. The arrival experience is further impacted through large scale artwork created by a local female artist. Once inside, separate and dedicated patient and provider zones and paths of travel allow providers to service patients quickly and efficiently. Use of natural light filled corridors and wayfinding graphics support self-directed wayfinding for patients. Universally designed neighborhoods including teamwork areas, exam and procedure rooms offer flexibility for reconfiguration and/or addition of alternate services to meet any future changing needs. There are no dedicated physician offices, instead care teams are co-located in an open plan office environment to encourage collaboration and promote team-based patient care. Additional amenities in the Center include a meeting room for educational purposes. This space will also be equipped to serve as a demonstration kitchen to empower enriched lifestyles for women and their families.